A couple of weeks ago we lost Maya Angelou. She was a role model. Being like her is how I wanted to live my life. She was smart, wise and everyone respected her. When Maya spoke, the world seemed to listen. From the moment I heard Phenomenal Woman, I knew what I wanted to be. We all have role models, both at home and at work. Dr. Marilyn Price-Mitchell recently wrote a blog post about the top qualities of a role model. She polled students as well as adults and found their answers to be very similar on this subject. Let’s examine some of the characteristics with the focus on women in business. Role models show passion for their work and because they have passion, those around them have passion. Have you ever worked with someone who complained about everything and after a while you find yourself complaining too? Well, it’s the same with passion. When you are near a woman who loves her job, its infectious. She infects you with determination, motivation and a good attitude. Role models have their values instilled in their spirit. We are not our jobs, but our jobs can dictate who we are if we are not careful. As women, our values can be tested at home, at our child’s PTA meeting, in the office and even at the gym. A role model does not have a problem saying “NO” when someone or something makes her uncomfortable. She understands that peace of mind means being able to look at herself in the mirror each day. 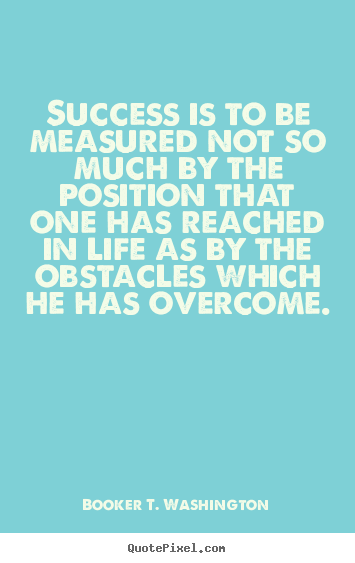 As Booker T. Washington once said, “Success is to be measured not so much by the position that one has reached in life as by the obstacles which one has overcome.” A role model perseveres and doesn’t wallow in self-pity. What I love about women is their ability to “bounce back” from various situations. We have households to run and children to raise so there is little time to sit and do nothing. Female role models prove this notion time and time again in the workplace as well. Even though there are many stereotypes about women not being able to make big decisions in the office, each day we are tearing that stereotype to shreds by running multi-billion dollar businesses and making key decisions that drive those organizations forward. Role models focus on helping others. They understand that helping other people means helping themselves. It builds character. Women have the worst reputation for not helping one another. I had this poor reputation in mind when I decided to host an event for professional women, PowHer Play 2014. This event will allow women to share knowledge, not just network. Sharing is a strong word that we need to embrace. We should also understand that building a synergy of collaboration is better than one of contention. PowHer Play is designed to make a statement.”Women CAN work together and as role models in our community we are mature enough to know that allowing others to shine means we are shining as well.” I started the Chatman Women’s Foundation with the premise of building women, not tearing them down. We owe it to each other to succeed and help someone else. For more information visit 4empoweringwomen.org or to get tickets to PowHer Play 2014, visit here. Editor’s Note: I am proudly sponsoring a table on June 27 and hope to see many of you there. It’s a great opportunity to connect, learn, share and grow. So, who are your role models? What characteristics do they possess? What are you doing to be a role model?